You are right….She must be a realative to Cousin It. Hmm how about converting him? Group shot is fantastic! And I see nothing wrong with 80s rock!!! Im glad that you like the group shot. Thanks for the feedback. Really nice group there, Paul! I especially liked the green gunk coming out of that coffin! Doubt I’d have the patience to paint Lady Justice, too much going on there. Her hair turned out really nice though… care to share the recipe? I’ve just recently finished a dwarven slayer and yup yup, he’s sporting that orange 90s ‘do. =( Would much rather see any future slayers with something close to Lady Justice’s hair colour. Lady J is quite a busy figure, thats for sure. It was a challenge to come up with a scheme that worked with the groups browns (essential for a cowboy feel I think) that also made the different elements of the sculpt clear without being too gaudy. I was pleased with how it worked out, but there were numerous points in the process that the whole thing looked like garbage. I was making up the hair as I went along, so some of the stages below could probably be rationalised out. On the other hand part of the reason that LJs hair looks OK is because it has layers of depth, so its hard to say. Layer random bunches WZ Vega Sand. A light wash of Baal red to pull it all together another bit and add less realistic, comic book colour to it to help contrast with the green areas..
A pretty laborious process realy, but seeing as the figure has so much hair, it was important to spend some time on it. For models with less hair (like Trollslayers) you could probably cut out a few steps. 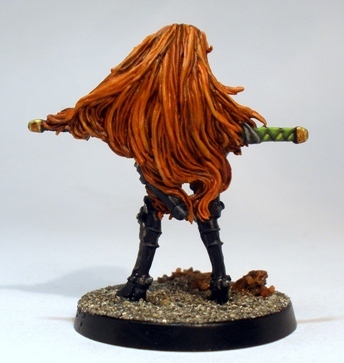 It might be worth noting that I painted her skin in quite pale tones as she is a redhead. If I had gone with my usual more tanned flesh look then it would have jarred with the hair a bit I think.